It was a case of the flu. OK. But before Red Wings goalie Jimmy Howard missed the last two games of the Red Wings' five-game series loss to the Bruins in the opening round of the Stanley Cup playoffs, he didn't play well. He was terrific in Game 1. There were a lot of factors why the Red Wings were ousted by Boston, not the least being the Bruins are simply a better, more experienced and deeper team. But the great equalizer in these playoff sets often is goalie. Tuukka Raak was way better than Howard and Jonas Gustavsson, Howard's backup. If you look at the Eastern Conference, do the Red Wings have the equalizer in goal? Montreal's Carey Price, the Rangers' Henrik Lundquist., Rask... the list of goalies in the Eastern Conference, let alone league-wide, better than Howard right now is pretty long. This is the bottom line on Howard, even before the flu he wasn't nearly good enough in this series. And Gustavsson is not the long-term answer. Howard has had five playoff runs with the Red Wings. He was very good in three of them. He was subpar in two. His save percentage this season was just 91 during the regular season, ranking in the 30s in NHL rankings. It was 90 percent in the last two games of the playoffs, including a couple soft goals in the equation. There will be some angst about whether Gustavsson will re-sign as a free agent, but the bigger issue is how willing the Red Wings are to let Petr Mrazek push Howard next season. He had a 55-save performance the other night in a playoff game for Grand Rapids, and did lead Griffins to the Calder Cup last season. It wasn't like Mrazek was overmatched with the Red Wings. In brief stints the last couple seasons, covering 11 games, his save percentage is .926 and he's pitched a couple shutouts. So he's only 22? So what? The Red Wings open up the goalie spot in training camp next season. They forget the ridiculous notion of getting Mrazek "overly ripe." They should have learned their lesson on the Gustav Nyquist fiasco early this season. And let the goalie play. - Brendan Smith earned his penalty late in the second period. Johan Franzen didn't. That 5-on-3 was bogus. Hate to see the refs take such control of the game. Let the players handle it. There should have been a call on the Bruins late in the period. Nothing worse than when arbitrary officiating takes over a Stanley Cup playoff game. 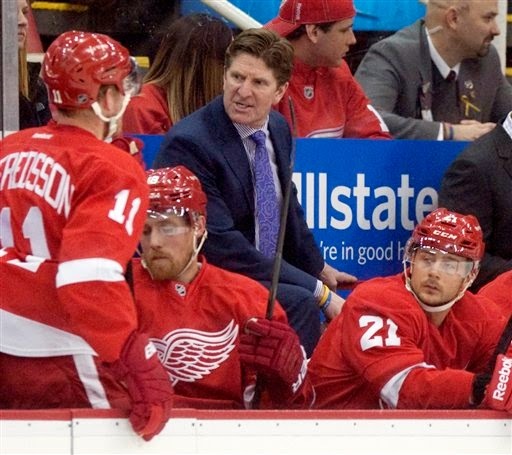 - The Bruins had plenty of opportunity to put the Red Wings away, and didn't. Boston's Milan Lucic let a golden scoring opportunity slip off his stick and then took an ill-advised penalty. It changed the momentum of the game toward the Red Wings. Bruins took it back, though, thanks to the refs. - Pavel Datsyuk has been a saving grace for the Red Wings in this series For all the talk about the "kids" during the season, they gotten lost in this series. Datsyuk, on the other hand, has shown up. - Horrible and unnecessary penalty by Danny DeKeyser late in the second period after the Red Wings had turned momentum. - The Bruins are poised, but the Red Wings are making this a lot tighter than anticipated, especially considering how Boston dominated the early portion of the game. - Jonas Gustavsson has played much better the last two games than Jimmy Howard performed in the previous two games for the Red Wings. When I was a kid, the term they used a lot describing an athlete who performed exceptionally well. but only briefly, was "flash in the pan." 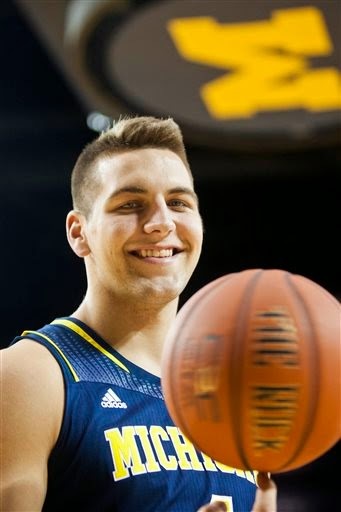 Mitch McGary fit the definition. He was outstanding in the 2013 NCAA tournament, while being spoon-fed by national player of the year Trey Burke, I might add.Other than that, he was disappointing. Part of that wasn't his fault (initial inexperience, a back injury), but being tested positive for marijuana during the NCAA tournament was his fault. McGary did develop a nice short-range jumper and does run the floor well for his size. But he isn't going to appear as massively big in the NBA as he did in the Big Ten. It's unlikely he will have much impact in the league until he becomes much more refined. That isn't going to happen for awhile, or if ever. He would benefitted greatly coming to Michigan, and the Wolverines would have benefitted from having him back, obviously. Testing positive for weed isn't going to help McGary fly up the draft board, and this is one of the best and deepest drafts in years. Amazing how one bad decision can take a logical ascent and throw it right out the window, turning what should have been a brilliant college to "flash in the pan" status. The Bruins have taken over control of the game. The Red Wings are very fortunate this is going to overtime. But they are still capable of winning this game. Tomas Tatar is picking up his play. They need a big moment from Pavel Datsyuk. - The Monster is doing OK tonight. It's just there seems to be such a huge edge in goal for the Bruins. - Hopefully for the Red Wings sake, the refs swallow their whistles. If the Bruins get on the power play, it does seem like this game will end quickly. Niklas Kronwall has been outstanding in this game for the Red Wings, not only because he has a goal and a pretty assist on Pavel Datsyuk's goal, but because he has been a steadying influence on the blue line. Boston really turned up the forecheck on the Red Wings during the second period. The momentum of the game has turned, but Kronwall is the biggest reason the Red Wings have a chance to keep it together. - Henrik Zetterberg isn't himself. He is getting knocked off the puck much more than usual. But he is a smart player, and there have been a couple times when he has kept the flow of a Detroit threat going in Boston's end. - Jonas Gustavsson has been more lucky than actually good in net for the Red Wings. But that's OK. He did rob Gregory Campbell with a great save. And he certainly has been any worse than Jimy Howard was in Game 2 and Game 3. Howard's performance had dropped off greatly after an excellent performance in Game 1. - Darren Helm's pure speed has been a big factor in this game. You can just sense how it makes the Bruins' defensemen feel uneasy. - It's amazing seeing what a graceful skater Boston defenseman Zdeno Chara is at 6-9, 270 pounds. That size didn't stop Justin Abdelkader from riding Chara very hard into the boards during the first period. Chara didn't like it very much either. The Red Wings do have to play physical hockey against the Bruins, they just can't do it after the whistle. That accomplishes nothing. - Strong evidence suggests Drew Smyly is much more effective as a reliever than a starter. He has allowed 14 home runs in 101 innings as a starter. He has allowed just four home runs in 86 1-3 innings as a reliever. He is 7-0 with a 2.50 ERA as a reliever. As starter, he entered today with an ERA above four. You can reduce the number of left-handers he faces from the bullpen. He has a great curveball, thrown from a very high arm slot. which is devastating against them. Lefties were hitting just .199 against him entering tonight. Right-handed hitters were hitting .256, but with impressive power numbers. - The more I see of White Sox rookie first baseman Jose Arbeu the more impressed I am. He is going to put up some huge numbers in the White Sox little home ball park. - It was only a flyout, because he didn't quite pull the ball enough, but you can see where Nick Castellanos is going to drive more than his share of home runs. He has a very live bat and excellent hitting approach for a 22-year-old rookie. The Detroit Tigers, Dave Dombrowski and the worst trade of all time? A long-term general manager is not judged by one trade. Good thing for Tigers' general manager Dave Dombrowski he has a lot of gems to pull out of his back pocket to display (Miguel Cabrera, Max Scherzer, etc.) when the Doug Fister deal is raised. That's because it has been a stinker and the stench just keeps getting worse. 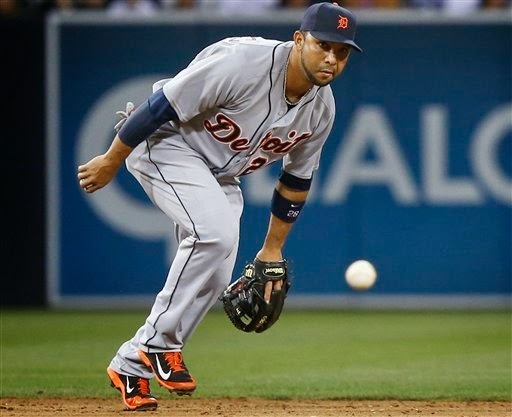 Sunday, the Tigers released shortstop Alex Gonzalez. He played just nine games as a 37-year-old displaying less range than a fantasy camper. He hit a hundred-something and his WAR was minus 0.6., which shouldn't come as a surprise. It was minus 1.2 last season. The Tigers traded Steve Lombardozzi, the utility player they acquired as part of the Fister trade in the winter, to Baltimore for Gonzalez, who could have been signed as a free agent. The Tigers paid Gonzalez $1.1 million for what was essentially a failed 14-game (nine played) audition. He was paid 78.571 per game. What addition to the G-Rod retirement fund. Lombardozzi reminds nobody of Ozzie Smith at SS, but he was OK there in spring training. Andrew Romine and Danny Worth are better than Lombardozzi at SS, but why just move him for nothing? He has played most days for Baltimore at second base and done reasonably well. A salary dump? Hardly. Lombardozzi is rocking a $518,000 salary for 2014. In fairness to Dombrowski, Ian Krol has helped the Tigers some already should be a good piece to the bullpen. He has touted left-handed pitching prospect Robbie Ray as being the key to the move. Ray is 1-2 with a 3.00 ERA at Toledo, averaging five innings per start and could at some point replace Drew Smyly in the rotation if it is deemed Smyly means more to the Tigers in bullpen than starting. But, at this stage, that's a big "if." The trade hasn't looked nearly as bad as it might if Fister were not on the disabled list with a lat strain after having some elbow issues during spring training. 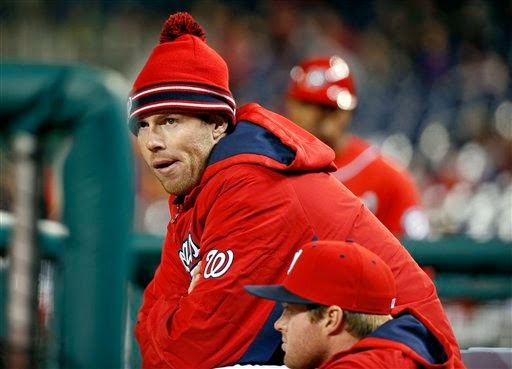 Fister has started throwing at the Nationals' extended spring training program, and could return in three weeks, according to latest reports. Can you imagine if he were off to a 3-0 start like he was last year, and this was going on? Yikes. It was unpopular trade at the time, and looks less promising by the day. - At least the Tigers have a lead to protect today. Ian Kinsler has been the difference in the game, but it shouldn't mask that the Tigers haven't played that well. There have too many errors and a lot of little mistakes. But the Tigers have gotten away with it, at least so far. - Alex Gonzalez hasn't not hit well and sometimes just doesn't make the routine play. Andrew Romine is better defensively and a left-handed hitter. It's not like Gonzalez is raking. He's not even hitting .200. I do wonder why Romine isn't playing more. - This is a reality, which may not make Tigers' fans that comfortable, but Anibal Sanchez did display a lot of inconsistency before he pitched with the Tigers. This type of outing in which he lacked command of the baseball wasn't that uncommon when he was with the Marlins. His career WHIP coming into tonight is 1.333 with a large sample size. Both Sanchez and Max Scherzer outperformed their track records by a wide margin last season. - It seems like Austin Jackson is not nearly the base stealing threat he was when he originally joined the Tigers. I thought it was a good call by manager Brad Ausmus to send him. I'm surprised he didn't make it. - I'm sure Terry Francona doesn't fine his pitcher's for walking hitters, but he probably should after Zach McAllister walked Alex Avila in that situation. 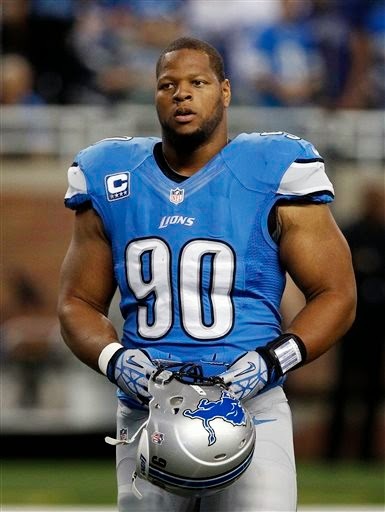 Reality TV star, submarine sandwich salesperson and mythic defensive tackle Ndamukong Suh made headlines again this week by being absent from the first day of the Lions' off season program. It was the start of new head coach Jim Caldwell's regime and his defensive star, a captain last season, wasn't there. It brought a major distraction. Caldwell was asked about it. QB Matthew Stafford was asked about it. RB Reggie Bush was asked about it. So was safety, James Ihedigbo, a free agent from the Ravens who hasn't even played with Suh yet. It wasn't about the team, and bouncing back from a terribly disappointing 7-9 season. Nope. It was about Suh. Again. There is a large segment of the Lions' fan base who buy into the Suh myth about how he makes everybody around him so much better despite statistics which are solid, but anything but great, since his rookie season. They will point out how these workouts are voluntary, and how Barry Sanders didn't show most of the time in the off season. I find such defending of Suh misguided. First of all, it wasn't good thing about Barry Sanders that he didn't involve himself more in the team's offseason program. Secondly, Suh doesn't have remotely the same impact on games Sanders did. The Lions aren't being unfair here. They want to sign him to a long-term deal, and could have improved their off-season position in free agency if Suh had been signed to a contract extension. As is, Suh is a $22.4 million salary cap hit, which has become an Albatross hanging around the franchise. All this for 5.5 sacks and 49 tackles last season, continued headlines for the wrong reasons, which have become a collective head for the team and its fans, the latter who, frankly, deserve better. When I saw the lineup Tigers' manager Brad Ausmus posted for Tuesday's game at Los Angeles, I couldn't help but laugh and think to myself, "What if Jim Leyland did that?" ﻿﻿﻿﻿Now, I understand Ausmus is in a bit of a tough spot without the DH on the road in interleague play, and still trying to get his two best hitters, Victor Martinez and Miguel Cabrera, in the batting order. There was a right-handed pitcher working for the Dodgers, Dan Haren. OK, Alex Avila had to go in at catcher to get another left-handed hitter in the lineup. The Tigers simply don't have enough left-handed punch against right-handed pitchers to pull Avila. They have to put Martinez at first and move Cabrera to third base. That means not playing rookie third baseman Nick Castellanos, another right-handed batter, but one of the Tigers top hitters. Martinez could go to catcher vs. a lefty. Haren is not the hard-throwing No.1 or No.2 starter he used to be. He is kind of a soft-tossing fourth of fifth starter these days. The Tigers made him seem like Orel Hershiser because they didn't have lefty threats in there. Ditto against the Dodgers' bullpen. The only reason they were able to rally late and tie it is because Martinez came up at just the right time. Notice how often-injured right-hander Josh Beckett, fresh off a multitude of ailments, is starting tonight for the Dodgers instead of left-hander Hyun-jin Ryu, who was originally expected to get the call?. Because LA manager Don Mattingly wasn't born yesterday. He knows exactly what type of predicament this puts Ausmus in. For one thing, it keeps Castellanos off the field and Martinez from going behind the plate. It puts Ausmus in a situation where he must depend on the left-handed hitting production of Tyler Collins or Don Kelly or Andrew Romine. Or stretch to the point he does bizarre things like leadoff Raji Davis instead of Ian Kinsler. In fairness to Davis, he did leadoff the game with a bloop hit. But his career numbers present a large sample size and don't lie. He has .652 OPS vs. right-handed pitching and .779 OPS vs. left-handed pitching. That makes him the very definition of a platoon player. He has also not been much of a leadoff, either, despite his speed and stellar base-stealing ability. His career numbers across the board are lower at leadoff than other spots in the order. Davis can be a very effective player or the Tigers, but only if put in spots where he can excel. Ausmus didn't put him in that position Tuesday. He played against the percentages - and lost. It shouldn't be a surprise. But this isn't just on Ausmus. He has been presented with a less-than-complete deck. Part of it is bad luck. If Andy Dirks weren't hurt, he'd have played, and there wouldn't have been such a nonsensical lineup. General manager Dave Dombrowski has presented Ausmus a 4-A cast in Dirks' place. It's why it is imperative for the Tigers that left-handed hitting outfielder Daniel Fields emerge at Triple-A Toledo. He is off to a pretty good start for the Mud Hens. If that continues, it probably won't be long before he is brought to Detroit. But if that does happen, it could be after this interleague trip. Wouldn't that be a bit late? Baseball trades are strange. Some that look like the best, turn out to be the worst - and vice versa. 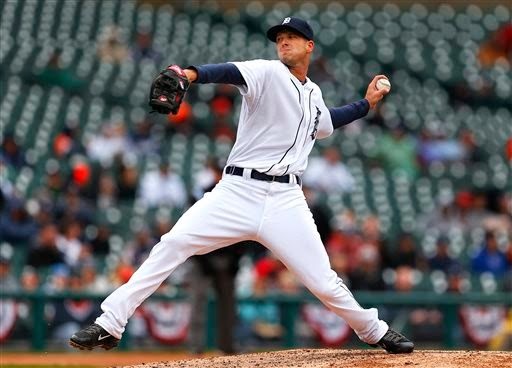 Drew Smyly: Is he best in bullpen? Few trades have been panned as much in this town, or nationally, as the Tigers dealing a solid starting pitcher, Doug Fister, to Washington for utilityman Steve Lombardozzi, lefty reliever Ian Krol and pitching prospect Robbie Ray. And it looked even worse this spring when the Tigers traded Lombardozzi to Baltimore for 37-year-old shortstop Alex Gonzalez, who hadn't played much in the major leagues in recent years and could have simply been signed during the off season. Oh, that was before Lombardozzi made a brilliant defensive play Sunday playing second base at Comerica Park in the Orioles' victory over the Tigers. There were circumstances - the injury to Jose Iglesias. But in the aftermath of the trade, I found it curious the first player acquired in the trade Tigers' general manager Dave Dombrowski discussed was Ray, the 22-year-old left-hander. Ray pitched well for half-season in Double-A last year. The Tigers loved the way he pitched against their Double-A Erie farm club for Harrisburg. But the Tigers are trying to win now. To me, it seemed, Ray's most value might come from being flipped into another trade as a prospect in-season. Well, it's turned out the Tigers' seem to think more about Ray's value to the big club now. That comes from him being put at Triple-A Toledo rather than Erie to begin the season. That faith, at least to this early point, has been justified. He threw five impressive innings in his first start Sunday, not allowing an earned run. The Tigers' bullpen is floundering. Dombrowski is already stockpiling 4-A guys at Triple-A, it seems just in case. What about Robbie Ray, though? Sound ridiculous? For sure, there has to be more success than one start at Triple-A. But there is a precedent for this from the Tigers organization. Joel Zumaya. Drew Smyly. Or Would the Tigers think about moving Smyly back to the bullpen and inserting Ray in the rotation at some point? Smyly'scareer numbers across the board are much better as a reliever than a starter in roughly the same amount of innings, including ERA (2.59 compared to 3.79) and WHIP (1.104 compared to 1.211). As for Fister, he hasn't come back to haunt the Tigers yet. He's started the season on the disabled list, after an ailment marred spring, because of lat strain. - He played well for new Lions' head coach Jim Caldwell in Indianapolis in 2011. He had a 2-3 record, the only two wins by the Colts that year, and his QB rating was pretty good (82.4). - He has a strong arm and good accuracy, which is debatable. 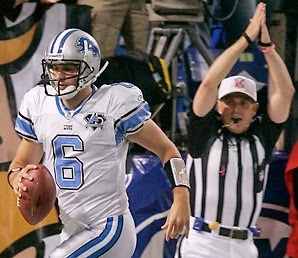 Dan Orlovsky: Who in this town doesn't remember this? 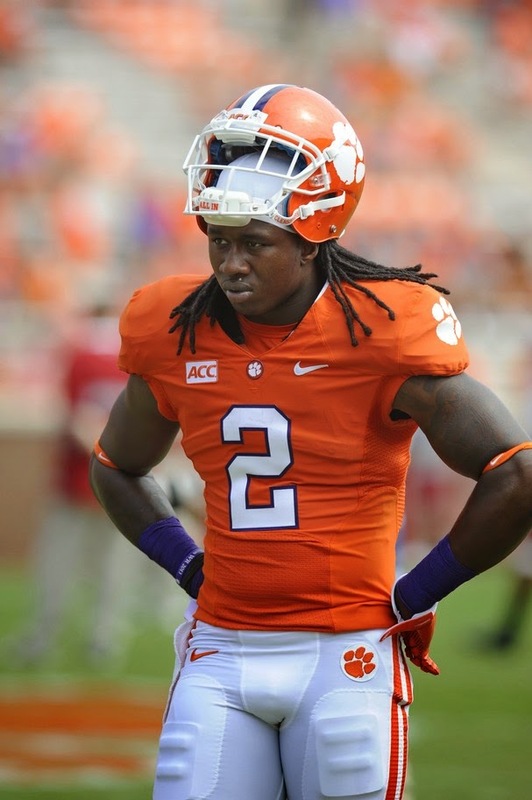 - He has good knowledge of the Lions' system because he played for Caldwell. It goes back to Ndamukong Suh and taking a $22,4 million cap hit because he hasn't agreed to a contract extension. Orlovsky is at the bottom of the list of free agents. He did start seven of the losses for the Lions in their 0-16 season, including providing the signature moment when he apparently forgot there is an end line and ran out of the end zone without being forced, for a safety. This entire town rolled their collective eyes at the news of Orlovsky signing with the Lions. It's subtraction by addition, when you think about it. I've always had an issue with Coach of the Year Awards. They should be re-named to the: "Coach of the Least Expected Team That Does Win Award." It's why the Red Wings' Mike Babcock, despite a terrific track record, has never won the Jack Adams Trophy for Coach of the Year. It's expected the Red Wings will win annually. Mike Babcock: His year to add the hardware? But this year, if the Red Wings get in, he deserves the award, The Red Wings are doing this against strong competition without their two resident stars, Pavel Datsyuk and Henrik Zetterberg, and without a top pair defensemen, Jonathan Ericsson, who recently proved to be a world-class player at the Olympics. 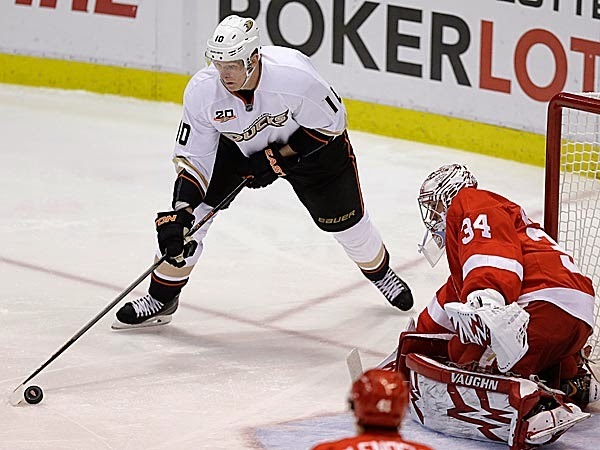 His goalie, Jimmy Howard, has only recently rounded into form after injuries. There has been a lot angst about how the Red Wings put together their roster early in the season, and the criticism is justified, but the Red Wings have more than made up for it with this late season run, if they complete it. Colorado has emerged this season under Roy, who has done a terrific job, but it's a classic case of getting early draft picks to build a team around. The Red Wings have no such luxury. Their emerging young stars were not early draft picks (Gustav Nyquist was a fourth-round pick, Tomas Tatar second round) and have been in their system awhile. Roy has numerous players who were ready to come of age or entered the league ready made.